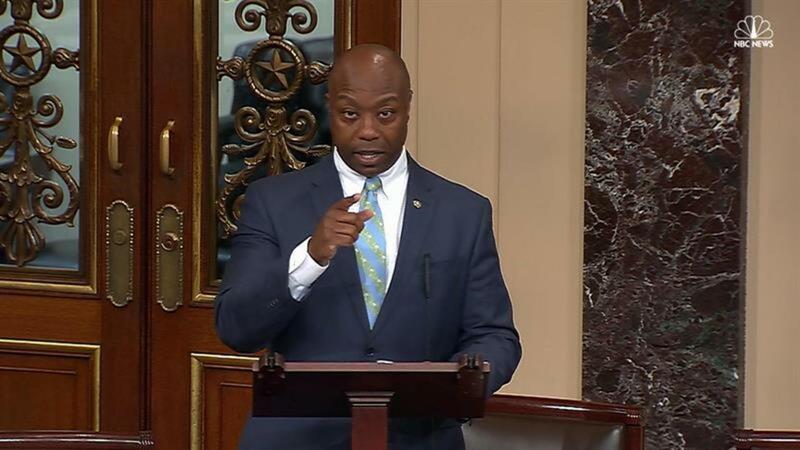 Sen. Tim Scott of South Carolina, the only black Republican in the Senate, delivered a deeply personal speech on race Wednesday, telling stories of the times he's been targeted by law enforcement officers for the color of his skin — even as a senator serving on Capitol Hill. Scott's speech comes as part of a national outcry about the state of race relations in America, following publicized cases of police violence that's led to the death of black men and women. In one of the most moving moments of his 15-minute speech, Scott told a story of a Capitol Police Officer who — even though Scott's been on Capitol Hill for five years, and wears a pin identifying him as a member of the Senate — forced him to show identification proving he was a senator. "I recall walking into an office building just last year, after being here for five years in the Capitol, and the officer looked at me with a little attitude and said, 'The pin I know, you I don't. Show me your ID,'" Scott said. "You know, I was thinking to myself: Either he thinks I'm committing a crime impersonating a member of Congress, or what?" Scott says he later got a call from a Capitol Police supervisor apologizing for the incident, but added that was the third time he received such an apology call. "So while I thank god that I have not endured bodily harm, I have however felt the pressure applied by the scales of justice when they are slanted," Scott continued. "I have felt the anger, the frustration, the sadness and the humiliation that comes with feeling like you're being targeted for nothing more than being just yourself." Scott also spoke of his experience with law enforcement outside the Capitol, saying he was once pulled over seven times in one year "for nothing more than driving a new car in the wrong neighborhood." "Imagine the frustration, the irritation, the sense of a loss of dignity that accompanies each of those stops," said Scott, who prefaced his speech by saying it was the most difficult he's given due to its personal nature. Scott, whose home state of South Carolina has been touched by police violence in the wake of the killing of Walter Scott last year, spoke the names of black Americans who were shot and killed by police. "I shuddered when I heard Eric Garner say, 'I can't breathe.' I wept when I watched Walter Scott turn, run away and get shot and killed from the back. And I broke when I heard the 4-year-old daughter of Philando Castile's girlfriend tell her mother, 'It's OK. I'm right here with you.'" Scott said. "These are people lost forever. Fathers, brothers, sons." Scott is expected to deliver another speech on Thursday laying out solutions to the racial inequality and injustice in America. But he ended Wednesday's speech with a plea. "I simply ask you this, recognize that just because you do not feel the pain, the anguish of another, does not mean it does not exist," Scott said. "To ignore their struggles, our struggles, does not make them disappear. It simply leaves you blind and the American family very vulnerable."